Based on a survey between all national Institutes of Internal Auditing in Europe this book shows a widespread picture of European Corporate Governance activities and Internal Audit: - Specific questions regarding the current involvement of Internal Audit in Corporate Governance aspects; - the State of the art of Internal Audit: position, scope and quality management; - Focal points for improving the role of Internal Audit in Corporate Governance in Europe. All insights of the book are concentrated on European companies and offer European solutions for Internal Auditing. They are empirically founded and written in a clear and direct way for practical use. 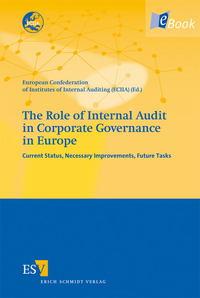 This is the first work for the European profession of Internal Audit that formulates eight focal points for improving the role of Internal Audit in Corporate Governance in Europe. The book shows how Internal Audit can fundamentally strengthen good Corporate Governance. Als gedrucktes Werk mit dem Titel The Role of Internal Audit in Corporate Governance in Europe erschienen.